By Nuel Suji – The National Assembly Joint Committee on the Independent National Electoral Commission (INEC) has approved N143 billion for the Commission for the 2019 elections. The committee adopted N143 billion which is the amount requested by President Muhammadu Buhari in his July proposal to the National Assembly. The amount is short of the N45.6bn proposed to be vired from the 2019 budget. Mr. Buhari had requested that a total of N189.2 billion be released to INEC. He asked that N143.5 billion be released this year and N45.6 billion in 2019. INEC Chairman, Mahmood Yakubu, who earlier met with the lawmakers had pleaded that the total of N189.2billion be considered, explaining that it does not conflict with the position of Mr. President. Minister of Budget and National Planning, Udoma Udoma, had also explained that the president requested the approval of N143 billion because he did not want an increase in the overall size of the 2018 budget. Mr. Udoma said if the joint committee wishes to approve the entire N189billion without resulting into increase in the N9.12trillion 2018 budget size, so be it and would be appreciated by the executive. 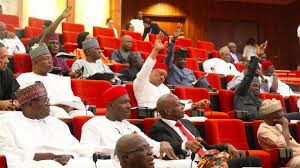 The INEC budget had generated controversy among the federal lawmakers with some, mainly those in the All Progressives Congress (APC) argued for the approval of N189 billion while the Peoples Democratic Party (PDP) lawmakers pushed for the adoption of N143 billion. Chairman of the joint committee, Suleiman Nazif, said INEC had been asked to represent the N143 billion for consideration, explaining that was the figure it adopted on Monday. “The joint committee sat and has come up with the resolution to adopt the N143 billion presented by Mr. President. It is also the wish of this committee that INEC present their budget of N143 billion as requested by Mr. President,” he said.